30 day refund available for any UNOPENED and SEALED software. If software has been activated no refund will be provided. We urge all customers to download the DEMO prior to purchase. *New Features: We have added the Gazzilli convention. *We have added 24 new challenging problem deals for a total of 506 Challenges. Kit Woolsey, multiple world champion and author of several bridge books, designed the new deals. *We have added six new Bridge Tournaments for free: the 2016 Cavendish (with cross-IMPs scoring), the 2017 NSWBA ANC Butler Open Selection (with Butler IMPs scoring), the 2016 New South Wales State Swiss Pairs (with Butler IMPs scoring), the Winter 2017 Blue Hen Sectional, the Winter 2016 Dave Treadwell Sectional, and the Spring 2017 Wilmington Sectional." 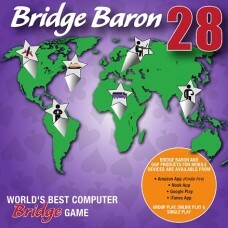 Not sure if that all fits; if not, we can instead say: "We have added six new Bridge Tournaments for free: the 2016 Cavendish (with cross-IMPs scoring), the 2017 NSWBA ANC Butler Open Selection (with Butler IMPs scoring), the 2016 New South Wales State Swiss Pairs (with Butler IMPs scoring), and three Sectional events (with matchpoint scoring). *We have improved the graphical user interface. *We have improved the bidding, declarer play, and defense.